Webot offers an easy way to share media file ( music and photos ) with multi-computers wherever they place. That means if you want share these media files with other computers you do not need upload files to web space. 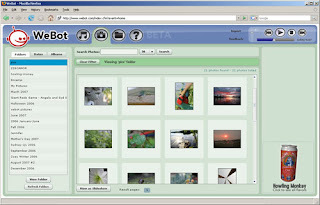 Webot gathers it all together and lets you access all of your media anywhere, anytime. But you need to do is to install a software that called "Bot" into every computers, after that you can click button to launch the Webot application, it will automatically find your newly installed "Bot" and walk you through the process of sharing folders that contain your music and photos. So you can login Webot and get sharing file any where around the world. If you have iPhone, Webot is also running with it.